GVL / Sheila Babbitt The Sudent Senate holds a meeting to elect new officers on April 5th, 2018. Voting will commence next week for the new Vice Presidents of the committees. 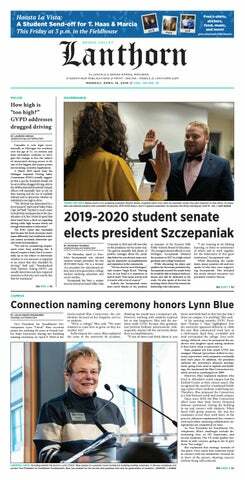 The last meeting for the current Grand Valley State University student senate was held Thursday, April 5, in the Kirkhof Center Pere Marquette Room. The senate's last briefs included the advancement of a fall-break recommendation to the University Academic Senate; the announcement of $2,000 saved at the end of the year; an update on the University Counseling Center's work on safe alcohol consumption; and the continuation of working with professors to find cheaper textbook options. The current senators ended their time together discussing new business, which involved giving their fellow cabinet members words of wisdom and expressing their gratitude for their year on senate. Students expressed how their committees had become like family and were the best part of their college experience, and their overall gratitude for the positive community senate had provided them. As the 2017-18 student senators reminisced about the year and captured moments with their cabinets through photos, the newly elected senators arrived right on time, eager to fill their seats. This year's student senate elections tallied a record 3,200 votes to put these students into office. The students remain senators-elect until the university president can swear them in officially. At this meeting, student senate president Jonathan Bowman was tasked with walking the new senators-elect through a routine senate meeting. The incoming senators learned the ins and outs of general assemblies, from the order of events to how to ask questions in the correct manner. Bowman informed newcomers that having a class conflict during a student senate meeting would result in them giving up their chair. Other requirements include clocking in an hour a week with the committee to discuss projects and two hours a week working in the student senate office. Bowman then listened to nominations for the new positions to be filled on the senate. Students nominated their peers, had to be seconded by another member of the senate and shared their rationale for why the student would fit the role. The student nominated then had the choice of accepting or declining the nomination. Speeches for those who were nominated will be held at the next cabinet meetings, which are on Thursdays at 4:30 p.m. Bowman is looking forward to the drive the senators-elect already possess and hopes they will make an impact in their time on senate. “There’s a lot of passionate people (who've) been elected to student senate,” Bowman said. “That tells by how many people voted in the elections: We had a record-breaking amount of people vote. It really shows the quality of people (who) have run.